I am so happy to present you Seaweed, which is about breathtaking beauty of underwater world and coral reefs! The watercolour kit is a set of patterns and backgrounds. They're great for business card design, wedding stationery, postcards, posters, book or album covers, digital media, art prints, product design, and so on. 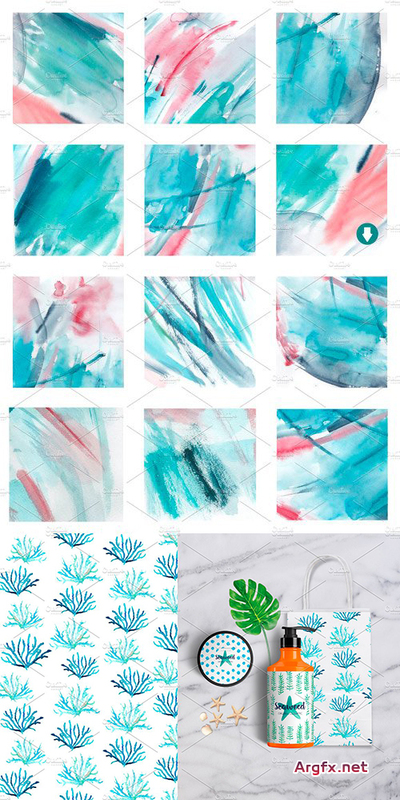 Here is what you will get: 11 Seamless Watercolor Patterns (JPG 27.7 in 8333 x 8333 px - 300 ppi ) 24 Watercolor Backgrounds (JPG size of the background vary from approx.2.7 in (1632 px) to approx. 5.3 in (3219 px)- 600 ppi).